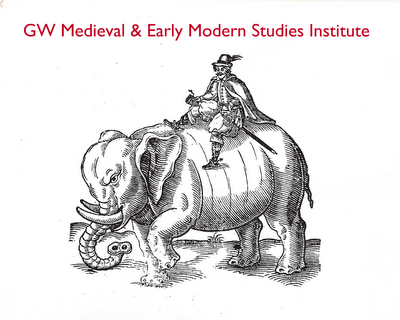 The GW Medieval and Early Modern Studies Institute aims to create an internationally renowned space to research the literature, history, and culture of early Europe, especially within a global framework. We foster ambitious humanities research that connects present and past. A joint initiative of ten GW faculty, GW MEMSI was founded with the support of twenty-two scholars from the DC area (Georgetown, AU, CU, UMD, the Folger Shakespeare Library and the Shakespeare Theatre). We now maintain an electronic mailing list of over one hundred names. The Institute is primarily focused upon research at the highest level. Monographs, essays in peer reviewed journals, and innovative doctoral dissertations are our most esteemed tangible outcomes. Yet GW MEMSI is also founded upon a principle of capacious outreach, especially towards undergraduates and scholars who do not work directly in medieval or Renaissance fields but who have much to gain through interdisciplinary, cross-time period collaboration. Simply put, while we aim to be a preeminent humanities institute, we also cultivate the next generation of field-changing researchers. The first year will be devoted to allowing the institute to realize its full potential as catalyst to enduring community ... We will hold four interdisciplinary research meetings, two each semester. These meetings will be traditional research paper presentations mixed with planning and community building. We will also sponsor visits by four scholars of international renown who work on topics related to the institute’s focus upon globalized early Europe. These high-profile visits have two objectives: to deepen the collective knowledge of the institute and refine its research aims; and to advertise the existence of the institute to scholars well placed to grow and disseminate our reputation ... A small group of us will visit established Medieval and Early Modern Studies institutes at other universities in order to articulate a set of “best practices” [and] to learn about the challenges these successful institutes have faced, and what strategies they have employed to secure external funding. · Marcia Kupfer, Art History, Ohio State University, "Abraham Circumcises Himself: A Scene at the Endgame of Jewish Utility to Christian Art"
· Andrea Frisch, French, U Maryland, "The Poetics of Forgetting in Sixteenth-century France"
A book launch for Gil Harris's Untimely Matter in the Time of Shakespeare and Marcy Norton's Sacred Gifts, Profane Pleasures: A History of Tobacco and Chocolate in the Atlantic World. We styled the event along the lines of a literary reading in order to gather a group of people who would not ordinarily attend an event at which Renaissance scholarship is being discussed. About 35 people came from around DC and throughout the university. · David Wallace (Judith Rodin Professor of English at the University of Pennsylvania) "Writing after Catastrophe: Conceptualizing Literary History and the Boundaries of Europe, 1348-1400"
· Lytton Smith (Columbia University), "The Unending Medieval and the Edges of Poetry." · Stephanie Trigg (Professor of English at the University of Melbourne), “"Mythic Capital: Medievalism, Heritage Culture, and the Order of the Garter, 1348-2008." The panel proved so successful in gathering information on best practices for medieval and early modern studies institutes that the money that had been allocated for site visits was used to send two affiliated graduate students to major professional conferences, where they presented their dissertation work in progress. 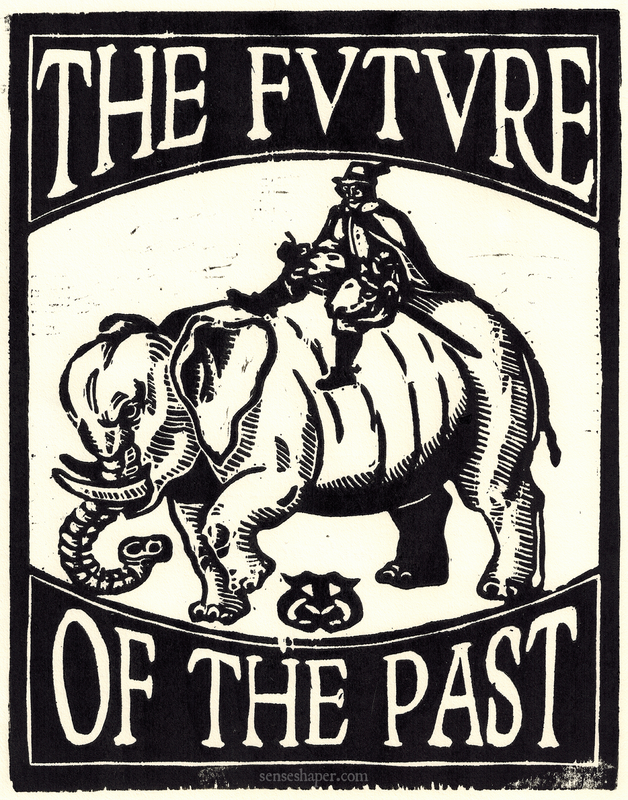 Submitted a proposal to the Arete Initiative of the University of Chicago to fund “Virtue and Its Histories: Time, Disciplinary Fixations, and the Limits of the Human” as part of the “New Science of Virtue” grant competition. GW MEMSI would have sponsored the project along with Eileen Joy (Southern Illinois University at Edwardsville), Jessica Palmer (AAAS Science and Technology Policy Fellow, National Institutes of Health, and Office of Science Policy and Communications) and Jonah Lehrer (editor at large for Seed magazine and author of How We Decide and Proust Was a Neuroscientist). We proposed the project in order to connect our research concerns to an important emergent topic in the humanities and social sciences. Total budget $257,500 over two years. Not funded. Established an electronic mailing (more than 100 names) and a website to showcase our activities (www.gwmemsi.com). The website has been accessed more than 10,000 times. We realize that our Institute will have a rapid impact on GW’s research reputation only if we advertise it widely. In addition to sponsoring the Shakespeare conference and the high profile Kalamazoo session, publicity came in the form of an article in By George, a press release by GW Media relations and the CCAS newsletter, and a mailing of postcards that directed scholars in the field to our website. Visiting scholars and the circulation of ideas are the lifeblood of a thriving humanities institute. Through the inaugural symposium, the research seminars, and the Gateway Lecture series, GW MEMSI was able to bring eleven distinguished scholars to campus. We publicized and created forums for our work via sponsorship of professional meetings and sessions at conferences, and we contributed to the training and professionalization of our graduate students (about twelve GW doctoral and MA students are affiliated with GW MEMSI). The session we put together at Kalamazoo served the dual purpose of giving the institute wide publicity and allowing us to gather information about the budget process, administrative structure, and mission of medieval and early modern studies institutes at comparable institutes. We discovered that we have achieved more in our first year of life than many of these achieve in several years of operation. We did not obtain outside grant funding, but we will submit two more applications in this next year. · Jeffrey Cohen: Cultural Diversity in the British Middle Ages: Archipelago, Island, England (Palgrave Macmillan, 2008), editor; “Time out of Memory.” The Post-Historical Middle Ages, ed. Sylvia Federico and Elizabeth Scala (Palgrave Macmillan, 2009) 37-61. · Gil Harris: Shakespeare and Literary Theory (Oxford: Oxford University Press, forthcoming 2010); Untimely Matter in the Time of Shakespeare (Philadelphia: University of Pennsylvania Press, 2008); an edition of Thomas Dekker, The Shoemaker’s Holiday (London: Methuen/New Mermaids, 2008); “The Untimely Mammet of Verona,” in Graham Hammill and Julia Reinhard Lutpon (eds. ), Points of Departure: Political Theology and the Scenes of Early Modernity, edited collection under review; “Alain Badiou’s Vanishing Jewish Letter,” in Kenneth Reinhard (ed. ), Alin Badiou and the Jews, edited collection under review, University of Chicago Press; “Shakespeare and Race,” in Stanley Wells and Margreta de Grazia (eds. ), The Cambridge Companion to Shakespeare (Cambridge: Cambridge University Press, forthcoming); “Mercantilism,” in Patricia Parker (ed. ), The Shakespeare Encyclopedia (Westport, CT: Greenwood Press, forthcoming); “Disease,” in Patricia Parker (ed. ), The Shakespeare Encyclopedia (Westport, CT: Greenwood Press, forthcoming); “Shakespeare after 5/11,” Shakespeare Yearbook (forthcoming 2009); “Ludgate Time: Simon Eyre’s Oath and the Temporal Economies of The Shoemaker’s Holiday,” Huntington Library Quarterly 71 (2008): 11-35; “Usurers of Colour: The Taint of Jewish Transnationality in Mercantilist Literature and The Merchant of Venice,” in Helen Ostovich and Mary Silcox (eds. ), The Mysterious and the Foreign in Early Modern Europe (Newark, Delaware: University of Delaware Press, 2008): 158-81. · Jonathan Hsy, “‘Oure Occian’: Littoral Language and the Constance Narratives of Chaucer and Boccaccio” in Europe and Its Others: Mediterranean Interperceptions, eds. Paul Gifford and Tessa Hauswedell (Peter Lang, forthcoming); “Translation, Suspended: Literary Code-Switching and Poetry of Sea Travel” in The Medieval Translator/Traduire au Moyen Âge, Vol. 12, eds. Denis Renevey and Christiania Whitehead (Turnhout, Belgium: Brepols, 2009) pp. 133-145. · Marcy Norton, Sacred Gifts, Profane Pleasures: A History of Tobacco and Chocolate in the Atlantic World (Cornell University Press, 2008). · Lynne Westwater, “Petrarch’s Lettere disperse,” The Complete Petrarch: A Life's Work (1304-1374), ed. Victoria Kirkham and Armando Maggi (Chicago: University of Chicago Press, 2009); “Women’s Writing in Seventeenth-Century Venice,” Storia di Venezia. Donne a Venezia in Età Moderna. Conference proceedings from international conference (May 2008), published online April 2009. <http://www.storiadivenezia.it/donneavenezia/pdf/Westwater_literary.pdf>; “A Cloistered Nun Abroad: Arcangela Tarabotti’s International Literary Career.” Intersections: Yearbook for Early Modern Studies. Volume 14 (2009): Women Writing Back, Writing Women Back: Transnational Perspectives from the Late Middle Ages to the Dawn of the Modern Era, forthcoming; critical edition of Letters of Arcangela Tarabotti. Prepared for “The Other Voice in Early Modern Europe” series, eds. Margaret L. King and Albert Rabil, Jr. (translated and edited with Meredith Ray). GW MEMSI certainly had its influence on a number of my publications: most notably, I presented a crucial chapter of a book at one of the MEMSI colloquia, and the comments of the participants helped me to reshape the chapter as I completed the final draft. I would add that the transnational emphasis of MEMSI has also informed my recent work on global polychronicities and the problem of local identiarianisms. GW MEMSI events were regularly attended by myself and Early Modern Europe graduate students, and formed a vital community of early modernists to sustain intellectual exchange. GW MEMSI is important for my work in two ways. First, it provides me a forum for meeting and interacting more closely with colleagues who share similar interests. Second, it provides stimulating exposure to issues outside the usual geographic and temporal scope of my work, exposure that has proved enriching and productive to my research. I think the GW Medieval and Early Modern Studies Institute has been a great success this past year. I have found it personally satisfying on two levels: first, through our monthly seminars, organized colloquia, and talks by invited speakers, MEMSI is solidifying interdepartmental and interdisciplinary relationships among faculty both within GW and in the medieval and early modern community in the DC area – I have met several faculty who I foresee will be important interlocutors in my future projects. Secondly, many of our speakers and colleagues who have shared their work with us have helped me set the theoretical framework for my next project on maternity and nation in early modern France. Except for one speaker, none of these projects have treated my topic or even my area of specialization directly. I mention this because I think the MEMSI seminars are influential to my work in a different, perhaps more important way: by engaging with work from other early modern-focused fields in such an intimate way, I have found myself inevitably reconceptualizing my own work in ways that are quite different from the methodological and conceptual approaches that are typical of my own specialization, and that will lead, I hope, to new inroads in the field. As an early career scholar I find the Institute most productively supports my research by facilitating active collaboration with scholars across institutions, disciplines, and different stages of professional development. A work I presented at an early GW-MEMSI meeting received helpful feedback from Institute members (including scholars from other fields and methodological approaches) and it now forms the basis of a chapter in my book monograph; a revised version of it will also appear in a peer reviewed collection that includes a contribution by one of the Institute's invited speakers (David Wallace) - this collection is tentatively titled Medieval Englishness and the Sea (Cambridge: Brewer, in progress). Insofar as professional development is concerned, the Institute's symposia, workshops, and conversations (formal and informal) continue to help me establish a scholarly voice, interrogate my own methodological approaches, and address a wider range of readers beyond a narrow specialization. GW MEMSI continually invited me to think outside of my disciplinary box. Finding a community of medievalists and early modernists to interact with and to challenge me has been a real catalyst to getting significant new research accomplished. I also appreciated the number of people from outside the field who attended the events. We already have scheduled two high profile research seminars, one of which has a significant electronic component; two meetings of the work in progress seminar; and a fuller series of Gateway Lectures. The faculty affiliated with the program will form a subgroup dedicated to seeking and applying for external funding, with the aim of completing two funding applications by the spring. In the spring we will hold an interdisciplinary colloquium on "Europe in a Transnational Frame." From this event will emerge the agenda of the conference to be sponsored by the institute in the 2010-11 cycle. We will begin looking into sponsored publishing ventures. We will also widen our membership to include GW faculty who were not involved in the original proposal. We feel that the Institute has become a vital contributor to the humanities research landscape at GW and would like to enable the participation of as many interested scholars and students as practical. The upcoming GW MEMSI seminar on Messianic Time and the Untimely will be electronic as well as live. All three presenters have generously agreed to make their papers available at the blog In the Middle about two weeks before the seminar. Comments made on the blog will become part of the live conversation September 17, and then we will post a summary of responses. We are open to suggestion as to how to make this seminar as electronically accessible (and useful) as possible. Unfortunately a webcast or podcast is not possible, but we are willing to consider almost anything else. 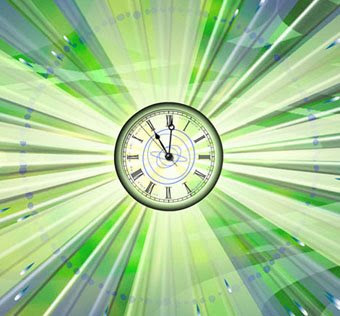 "Messianic Time and the Untimely"
1. Kathleen Biddick, "Dead Neighbor Archives and Messianic Time"
2. Julia Lupton, "Paul Shakespeare: Exegetical Exercises"
3. Jonathan Gil Harris, ""The Untimely Mammet of Verona"
The seminar will be held in the conference room of the English Department of the George Washington University (Room 771, 801 22nd Street NW Washington DC 20052). The seminar will also offers opportunity for electronic participation.